This is when some of the fun goes out of Sundays . 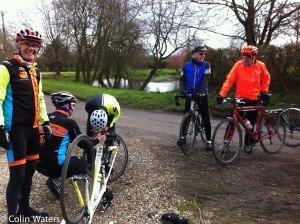 . . a bike upended in a gateway outside Clays Farmhouse on the Wellington Estate while Saty's stubborn, punctured tyre is prised off for a replacement inner tube. It's windy, it's cold but there's 25 minutes to stamp your feet to keep warm and enjoy the surroundings; great shows of daffodils and a picturebook pond. It just emphasised that Jim's obscure but picturesque back-lane route would find out anyone without robust tyres. Serendipity produced huge wedges of irresistible chocolate cake but you wonder how these out-of-the-way garden centres survive when you rarely see a customer. One or two oddities on the 41-mile jaunt: an elderly, knock-kneed woman taking her bandy dog for a walk, the ambiguous road sign advising "Horses Please Slow Down" and the flock of frightened sheep stampeding into the distance as nine colourful bikies rode past their field. 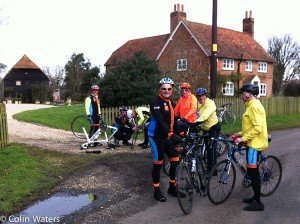 Saty's luck ran out again, halted by another puncture three miles beyond Odiham on the return leg. Jim decided that we shouldn't all stand around freezing a second time, the group broke up and headed home.